Dürer is born in Germany in 1471. The father, a successful goldsmith, pushes him to follow his steps, even after noticing his child’s talent in drawing. 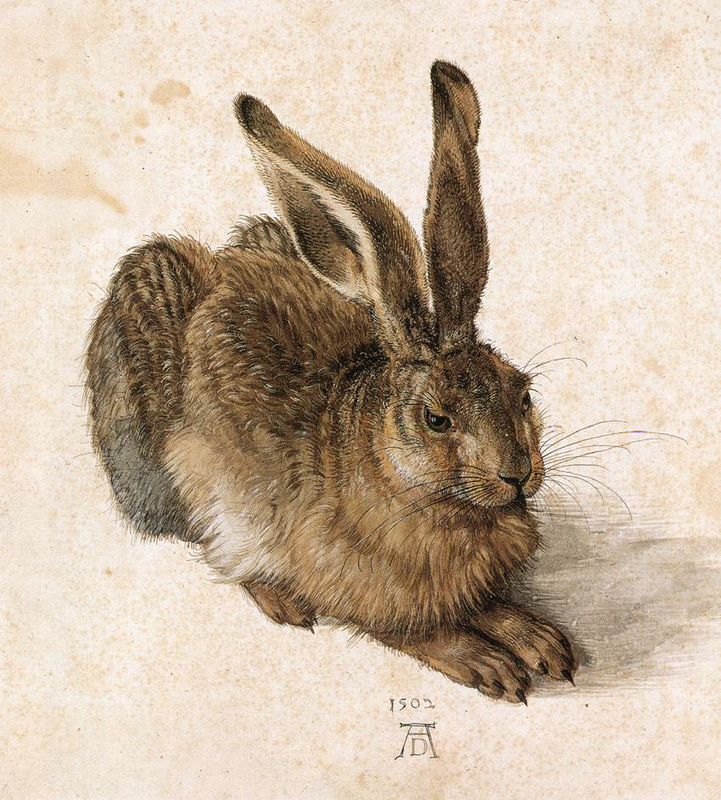 That’s why, with 15 years, Dürer was sent as a pupil of a famous engraver and, after he learned his craft, the artist takes a year to learn from the skills of other artisans from abroad. But, instead of taking only one year, he took four. In that period, young Dürer continues with his hobby of drawing and painting during his long travels. When he gets to Italy, the birthplace of renaissance, he decides to take his hobby one step further. He then came back to Nüremberg and put his workshop together. He starts with essays on animals and still lifes. And, of course, here is when he paints Hare. Let us notice that this is not one of the artist’s masterpieces, but it is simply an essay of his first stage as a painter. But, even though, his talent cannot be denied: the morphology of the animal is really exact and its fur, for which he uses different tones and light changes, is greatly accomplished. Although the work from today does not have the usual characteristics of a renaissance painting, I’ll it under that category simply because of the historical period in which it was painted. ~ by Álvaro Mazzino on January 10, 2011.
what is graphic art or painting? Hey, it is watercolour and bodycolour. Howdy, Cool write-up. You will find there’s trouble together with your site around website traveler, could possibly take a look at? Internet explorer on the other hand is definitely the sector main as well as a large piece of others will don’t include a person’s excellent crafting for this reason dilemma. Controlling acceleration and braking in racing games on a touchscreen has been “very binary”, the site notes, but AG Drive allows players greater control with differing amounts of pressure applied to the screen. This entry was posted on January 10, 2011 at 17:20 and is filed under Renaissance.You can follow any responses to this entry through the RSS 2.0 feed.You can leave a response, or trackback from your own site.